Joe Paduda has posted a steamy Health Policy Heat Wave edition of Health Wonk Review over at Managed Care Matters. He notes that “Far from the summer doldrums, activity related to the debt limit, IPAB, Medicare reform and Health Exchanges is at a late-September pace.” Get in on the action, Joe always hosts a lively and informed edition. Coming & Going – Roberto Ceniceros discusses the compensability case of a NC public school principal who was shot while driving to work. This is an interesting case because the principal was conducting phone business on a school-issued phone while commuting and he was also paid for travel expenses. He was awarded benefits, but the case is headed for appeals court. Ceniceros notes that injuries that occur during a commute generally are not compensable. He also notes that this might be some of the earliest case law on this issue. And with the brave new world of ubiquitous work enabled by mobile devices, it surely won’t be the last. Radical change – Peter Rousmaniere talks about the recent Illinois workers’ comp reform and the radical change that the reform signified for workers’ comp, change that he notes has largely gone unnoticed. He discusses two significant issues that surfaced in the reform: the “nuclear option,” which Rousmaniere noted “freaked out almost everyone” – yet despite the dramatic language, an opt-out or non-subscribe program has long existed in Texas. The second issue that he notes is “an easy-to-overlook provision” that allows for union carve outs, which he discusses in greater detail. 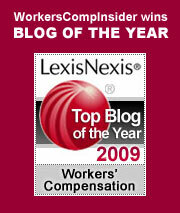 Peter’s take on all things workers’ comp is always well worth reading. FL CFO tackles check-cashing fraud – WorkCompWire reports that the Florida CFO will be reviewing check cashing services for collusion in workers’ comp fraud, which is said to be diverting more than a billion dollars from Florida’s economy. According to CFO Jeff Atwater, this latest workers’ compensation premium scheme is highly organized and orchestrated by individuals who know the construction and subcontracting industry and are intent on evading payment of workers’ compensation premiums. MA AG recoups millions in drug overcharges – In the latest of a series of settlements, Rite-Aid will pay $2.1 Million to resolve allegations of prescription drug overcharges. The settlement is the 5th in a series of similar settlements, the result of an investigation by Attorney General Coakley’s office into prescription drug overcharges by pharmacies to public entities under the workers compensation insurance system. Settlements now total $7.9 million. Walgreens recently settled for for $2.8 million. Other pharmacies with settlements include CVS, Shaws Supermarkets, and Stop & Shop. Recouped money will be returned to cities and towns. World’s scariest job? – If not the scariest, it certainly is a contender: Chinese Road Workers. For other scary jobs, see our post on the workers on the cruise from Hell and the untethered tower workers. I’ll stick with blogging, thanks. David Little worked for B & L Ford in Ashland, Pennsylvania. He suffered a shoulder injury in October 2005. He worked light duty up until January 19, 2006, when the employer received a letter from his attorney stating he was unable to perform any manual labor. The employer advised Little to secure a note from his doctor regarding his ability – or inability – to work. His doctor gave Little a letter stating he was unable to work, but before Little had the opportunity to present the letter to B & L Ford, they sent Little a letter of their own, terminating him. Little spent a weekend brooding over the termination. He called his wife home from her job on Monday. She found Little at the kitchen table, holding the termination letter. He stood up and then collapsed from a heart attack. Emergency workers had to pry the letter from his hand. Little died later that day at a hospital. Was this a work-related fatality? Little’s widow filed two workers comp claims, one for Temporary total benefits up until the death, and one for death/survivor benefits. A workers comp judge awarded temporary total disability benefits up to the date of Little’s death; once Little became “unavailable” for work (i.e., dead), the benefits ceased. On the issue of a work-related fatality, the judge found – and the Commonwealth Court of PA upheld – that the death was not work related, as it neither occurred “in the course and scope of employment” nor did Little’s activities on that fatal day “further the interests” of the employer. There is no question that the loss of his job was a significant, perhaps predominant, factor in Little’s death. However, personnel actions (discipline, demotions and terminations) are generally excluded from workers comp coverage. The sequence of events that began with his attorney’s letter culminated first in the loss of the job and then in a fatal heart attack. Given that Little had filed a workers comp claim and the employer apparently fired him because of his injury, the widow might be able to sue for wrongful termination. But the courts have made it clear that aside from a modest indemnity payment for lost time, workers comp will provide the widow no solace and no support for the work-related loss of her husband.